Source: White, R.G. ed. The Complete Works of William Shakespeare. New York: Sully and Kleinteich. The Cast of Characters is Presented. The watchmen and Horatio encounter a familiar spirit at Castle Elsinore. Claudius explains his hasty nuptials. Gertrude and Claudius have a request for Hamlet. Hamlet continues to lament his loss. Laertes counsels Ophelia in matters of the heart. Polonius gives his son some fatherly advice before he departs. Hamlet, Horatio, and Marcellus wait for another encounter with the spirit. The spirit gives Hamlet some unsettling news. Hamlet, Horatio, and Marcellus take an oath of secrecy. Poloinius intends to keep a watchful eye on Laertes. Ophelia reports a strange encounter with Hamlet to her father. Claudius and Gertrude hope that visitors will help with Hamlet's mood. Claudius receives news from Norway. Polonius, believing he has discovered the cause for Hamlet's madness, attempts to have a conversation with him. The arrival of the acting troupe gives Hamlet the opportunity to devise a trap for Claudius. Gertrude and Claudius agree to see the play. Polonius and Claudius secretly observe Hamlet's behavior leading Claudius to an unsettling conclusion. Hamlet prepares the actors for their performance. Horatio agrees to help Hamlet by observing Claudius. Claudius' behavior during the play is very strange. Hamlet is summoned by Gertrude. Claudius prepares to dispatch Hamlet to England. Hamlet, encountering Claudius in mid-prayer, resolves to act later and under different circumstances. Polonius attempt at eavesdropping does not go as planned. Hamlet encounters the ghostly visitor once more. 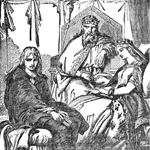 Gertrude tells Claudius of her encounter with Hamlet and Polonius' fate. Rosencrantz and Guildenstern confront Hamlet. Claudius announces the fate of Polonius to his attendants. Rosencrantz, Guildenstern, and Hamlet depart for England unaware of the King's intentions. Hamlet's encounter with Fortinbras fortifies his desire for revenge. Ophelia behavior is cause for concern. Laertes returns from France seeking revenge of his own. Horatio receives correspondence for Hamlet, who has returned to Denmark. Claudius meets with Laertes to discuss Polonius and Hamlet. Gertrude tells Claudius of Ophelia's fate. Hamlet and Horatio come upon two grave-diggers. Hamlet ponders the inevitability of death. The arrival of Ophelia's funeral procession results in a confrontation between Hamlet and Laertes. Laertes' and Claudius' scheme does not go as planned. Hamlet instructs Horatio as Fortinbras prepares to enter the castle. Shakespeare, William. Hamlet. Lit2Go Edition. 1605. Web. <https://etc.usf.edu/lit2go/94/hamlet/>. April 19, 2019. William Shakespeare, Hamlet, Li2Go edition, (1605), accessed April 19, 2019, https://etc.usf.edu/lit2go/94/hamlet/.